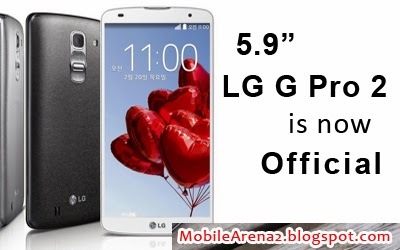 It was long expected by LG fans and there were many rumors that a sequel of LG G Pro is in the making. So, after a long wait, today the korean company LG has unvealed its brand new model LG G Pro 2 handset in Korea. The device has the same design pattern as we have seen in the making of famous model of the company the LG G2. It has same very thin bezels, and hardware buttons on the back side of the phone that is targeted right below your middle finger when you hold the phone in your hand. The newly announced phablet LG G Pro 2 has a quite large 5.9-inch display which is Full HD (1080 x 1920) and it has IPS technology. It weighs a good 172 grams. Its measurements are 157.9 × 81.9 × 8.3 mm. But one thing to be noted that the Korean company claims it a smartphone, not a phablet. It runs on Android 4.4 KitKat right out of the box and it is coming with an “evolved” KnockOn feature called Knock Code. For the moment, the uncomplete translation of the press release announcing the handset doesn’t allow us to fully understand how the new feature works. The G Pro 2 is LG’s first handset of the company that has a high-power 1W speaker. It should make the phone truly a multimedia powerhouse. It will enhance the audio quality of tracks and it will fulfill the need of a high class audio system. This phone has 2.1MP front-facing camera, and a 13 MegaPixels primary camera pared with LED flash and OIS plus (an improved version of the Optical Image Stabilization which debuted on the LG G2 last year). The main camera of the phone is also capable of recording 4K Ultra HD videos of 3840x2160 pixels.There are many other features are present in it which are LTE-A connectivity, NFC. It has a handsome 2.26GHz Quad-Core Snapdragon 800 processor with a 3GB of RAM. Its internal memory is 32GB and it also have MicroSD card support. It has 3,200 battery which is apparently removable. According to the company, the LG G Pro 2 will be launched later this month in South Korea, via all major carriers and it will be available in three colors - white, silver, and "titan".The detail about Pricing have not been announced. This new smartphone will also be released around the world, but specific details on this have not been announced yet. We’ll probably find out more at MWC 2014 in a couple of weeks.